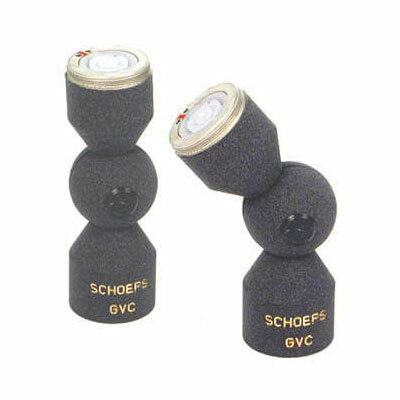 The electrically passive GVC capsule swivel may be inserted between any capsule and microphone amplifier of the Colette modular system, or before an Active Cable, Active Extension Tube, or the CUT 1. The GVC is especially useful with capsules intended for frontal sound pickup such as the MK 4 (cardioid).Laterally-addressed capsules (MK 4V, MK 41V, MK 4VXS, MK 6 and MK 8) can be used on the GVC with a small elastic ring which we will supply at no extra charge. This ring should be slipped over the threads of the GVC so that the capsule can be aimed in the desired direction. Furthermore, the GVC is often used on a boom for film sound recording, since with its use, an MK 41 supercardioid on a CMC 6 amplifier can be used very close to the ceiling while aiming downward.